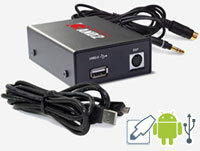 Android, USB, and AUX Car Integration Kits. Direct connection of Android phone, USB flash drive or mass storage device, and AUX-In 3.5mm jack connection for many factory stereos. Android MicroUSB and 3.5mm cables are included!